I have to say that with this cool weather well and truly hovering over Sydney, we have been doing lots of entertaining around the fireplace with tea, cake with a little bit of champagne thrown in for good measure. I must try to get my Mediterranean diet back on track very soon, but I do love catching up with friends and afternoon tea is a stress free way to do it. It usually involves way too much sugar and alcohol, but life is too short to worry too much about that on the weekend. I figure if I stay away from this stuff midweek, then all will be well with my healthy eating quest. 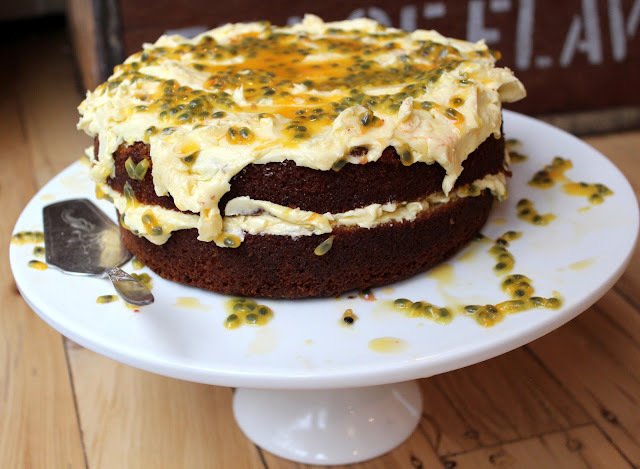 This cake is beautifully moist, very easy and completely delicious. Preheat the oven to 180 C or 375 F.
Grease and line the bottom of a 25 cm/9 inch cake tin. add milk, yoghurt and vanilla. Sift in flour, baking powder, bicarb of soda and salt together. Then add the coconut. Mix well to combine. Pour batter into a cake tin and cook in the oven for 40 minutes until a skewer comes out clean. 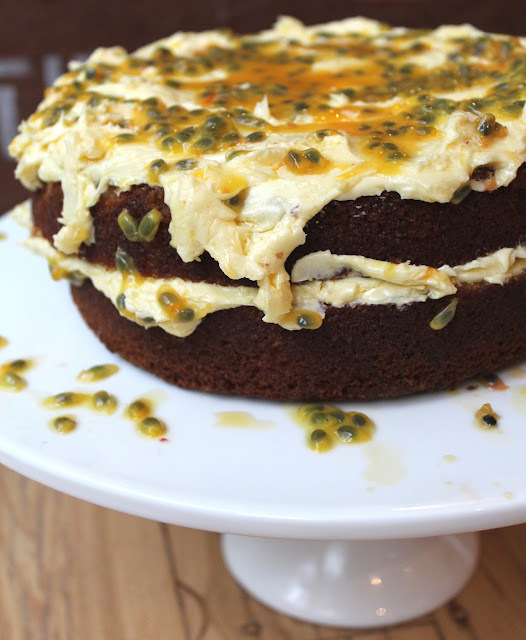 Allow cake to cool in the tin for 20 minutes, before turning out onto a wire rack to cool completely. Beat the butter and icing sugar to combine. Add the passion fruit and mix well to combine. Carefully cut the cake in half. Spread the bottom half with icing. 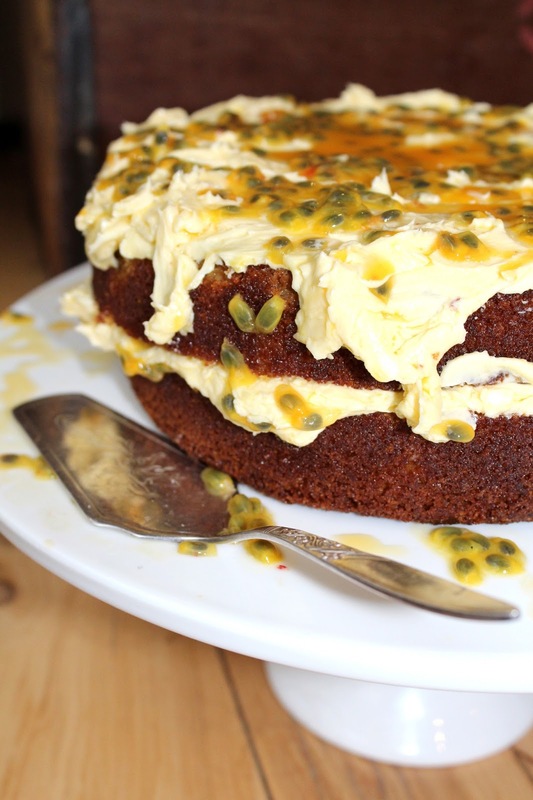 Then spread the remaining icing on top and garnish with generous dollops of passion fruit pulp. The clean up is easier too for afternoon tea, than a 3 course meal and really it's about seeing friends rather than stressing myself to the max trying to impress them. A few cups and saucers, a cake plate and some forks and spoons into the dishwasher and it's done. Personally I 'love' my dishwasher and have been known to burst into tears when I discover it has broken down. Not sure what that says about me, but I truly believe it is the key to keeping a kitchen clean. Life is too short, but now it seems a kitchen isn't with DishDrawer Technology. Fisher and Paykel have created four different sized ergonomically designed DishDrawers to fit any kitchen layout. We don't think twice about having a refrigerator, oven or cook top in the kitchen and now there is no need to compromise on convenience without a dishwasher either. what a wonderful flavour combination! Coconut and passion fruit are plenty on my island, however I have never made this kind of cake-never come across my mind! Thank you for sharing. It looks easy to make at home..!! Noooooooooo..... I have been eating way too many cakes!! But now I MUST try this one, it looks too bloomin' good to miss out on... your idea of cakes for the weekend and the good clean eating in the week is really good. But I have lots of chocolates to hoe my way through this week so .... yes, hubby came home with heaps of chocolates, much needed. 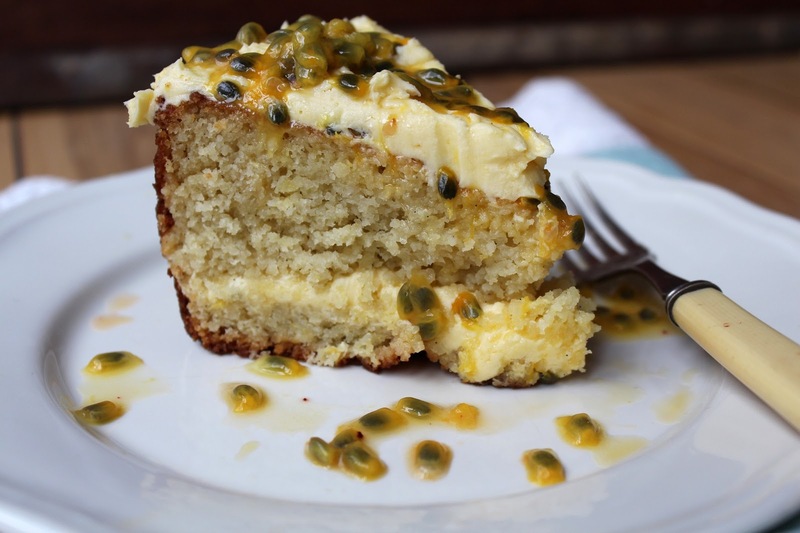 Bookmarking this lovely recipe. Thank you! Sounds yummy, very tropical. Maybe I'd have a pina colada with it, instead of tea! I love coconut. Looks like something I would love to have with my afternoon coffee. Yum!!! That looks like heaven ESP with half a cow in it !! Yum. I'm not having sugar for 3 mths, I have to get in the Mediterranean way now, so was experimenting with chickpeas and cacao on the weekend. Made some truffles and a choc slice thing. You use dates as the sugar. Gave me a tummy ache as I ate too much!! It is after all , beans. How can you possibly stick to a diet in your house when you cook yummy things like that! This looks amazing- pinning it now! 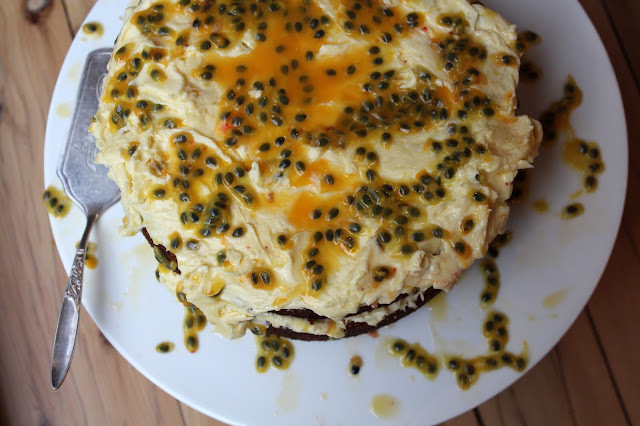 The passionfruit looks very inviting. As per the previous comment. I don't think I could stop at one slice.